When you have been commentator on the Eurovision Song Contest a total of 24 times and furthermore hosted your country’s national final 11 times you become a legend – and that is what Jørgen De Mylius is in Denmark. In a newly released book he talks about his long career. Jørgen De Mylius got to play a big part when Denmark re-joined the Eurovision Song Contest in 1978 after a absense of 12 years. For the first time he hosted the national final, Dansk Melodi Grand Prix, and became commentator on the international final, something that would then become a tradition. Very few people become so involved as he has been with hosting Dansk Melodi Grand Prix 11 times and commentating the Eurovision Song Contest 24 times. Surely he has a lot to tell about this glorious career – and that he does in a newly released memoir book. The book is titled Tak For Al Musikken (Thanks for all the music, edt.) and includes forewords written by no other than Sir Cliff Richard, who represented the United Kingdom twice at the Eurovision Song Contest; in 1968 and 1973. 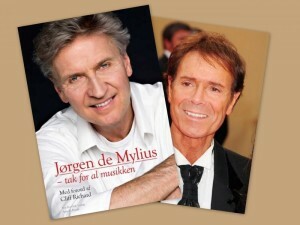 Those two are private friends and Jørgen has also previously written a book about Sir Cliff. The book takes you through 50 years of work with radio and TV as Jørgen De Mylius started working at DR in early 1963 at the age of just 16. It is in relation to that 50 years anniversary that the book has been written. Recently Jørgen De Mylius was awarded for his work through the many decades. You can read more about that in our previous article. The book is written in Danish and currently available through the Danish CDON with 28% discount. You find the link below this article.